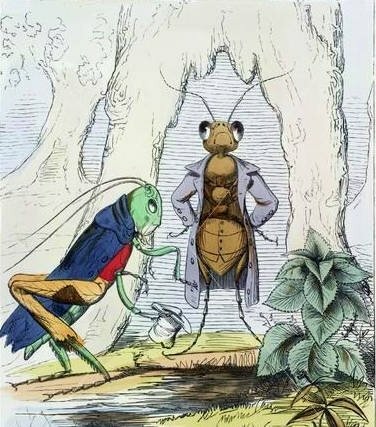 I especially like the way he changed the ant and grasshopper fable. 1. I added another character: Spider, who’s role is only minor one and many other animals with even less important roles. We’ll meet them later. 2. I expanded setting with a tiny twist: this time Ant comes to Grasshopper. You see, she is concerned about her neighbor. We don’t know if she came to her place to offer a help or to mock her misery, but we also can’t accuse her of cruelty as we can in Aesop’s version. 3. As you have already noticed, I didn’t change the basic plot. I definitely want people to know where the idea came from and how I used it to make something new, useful and hopefully beautiful. 4. This time Ant is on a mission. As I said, we don’t know why she came to the Grasshopper, but she is the one who goes out. 5. Now the Spider enters as a helper. He, not the Grasshopper, opened Grasshopper’s door. That’s it. I said it is a minor role. But Ant is shocked and listeners are all ears. This is what a storyteller wants. To be heard! 6. We don’t have one on one confrontation here, instead of that Ant is confronted with great discovery: Grasshopper’s home is really a concert hall where she performs her music to wide audience. She is not hungry at all. She is even selling tickets for her performances! 7. Happy ending for everybody: Grasshopper is still enjoying playing her music, all other animals are enjoying listening to her music. And if you insist on the moral: Everybody has his own way to happiness!